You and your crew never back down from a challenge. From mountain biking at breakneck speeds to snowboarding a half pipe to parasailing, you tackle every extreme sport with vigor. You love the rush of adrenaline you feel when you conquer the most daunting of tasks. Are you looking for new outdoor adventures in Georgia? Then it’s time to give Southeastern Expeditions a try. Our whitewater rafting trips will provide exciting ways to test your physical strength and courage. Get your gang together, and get ready for an experience you won’t soon forget. You can explore other options in the area as well. With rafting, zip lines, free falls and extreme adventure parks, Georgia and South Carolina are full of amazing activities. 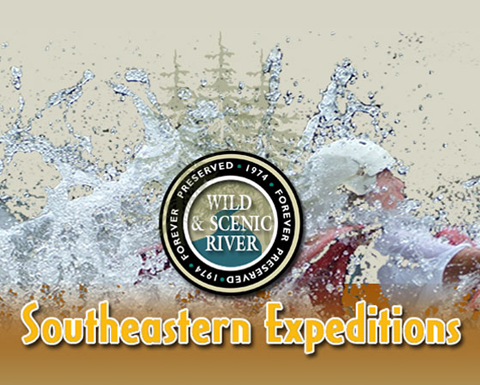 The best outdoor recreation option in Georgia begins at Southeastern Expeditions. We have a Section IV trip for intermediate to advanced adventure seekers that offers seven hours of thrills. Our guides know this river. They set you up for a difficult yet attainable goal of working together with your group to get through some tough rapids. By using your combined strength and wit, you can paddle through one of the most scenic areas of this southern region. Your guides will keep you entertained the whole time, sharing stories and experiences from past trips and instructing you when you need assistance. A Section IV trip with Southeastern Expeditions is a one-day getaway you’ll talk about for years. Looking for Other Weekend Adventures in Georgia and South Carolina? 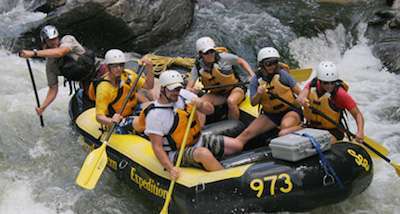 Raft1, Ducktown TN: Our sister outfitter, and the Top Rated White Water Rafting experience in Tennessee. With Ziplining, Horseback Riding, Mountain Biking and more available, Raft1 was built from the ground up to be your preferred adventure center in the Southeast. Banning Mills, Whitesburg, GA: You can free fall and zip line here. Climb to the top of a 100-foot tower, strap yourself onto a cable, and tip yourself over the edge. The last 20 feet, you slow down and end up on your feet. The zip line course slips through tree canopies and will leave you breathless. Andretti Indoor Karting and Games, Roswell, GA: Drive go-karts that race up to 40 mph and climb the Cosmic Rock Wall just to warm up. Wind down with a ropes course and a 7-D theater experience. Lookout Mountain Flight Park, Rising Fawn, GA: The country’s biggest hang-gliding school offers a 1,340-foot launch and lessons all year long, except Christmas Day. Gravitopia, Greenville, SC: This extreme air sports park has everything from a ninja obstacle course to trapeze training to aerial silks suspended well above a foam pit. When you plan ahead, you can enjoy an extreme vacation with un-matched appeal in Georgia and South Carolina. Get in touch with us today to book your whitewater rafting trip.